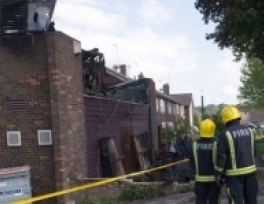 An Islamic center in north London was destroyed in a suspicious fire on Wednesday, June 5, to the shock of the Muslim community in Britain. “We’re gutted and shattered, it’s heartbreaking,” Ahmed Ali, who works at the Al-Rahma Islamic Centre in Muswell Hill, told London Evening Standard. A blaze totally destroyed the two-storey Islamic center on Wednesday. A graffiti reading “EDL” was painted on the wall of the burned center, in reference to the far-right English Defence League. Scotland Yard said it was treating the fire at the Somali community center as suspicious. “We are all shocked by what has happened,”Ali Abu, 30, of the Somali charity BritSom, told The Daily Mail. The arson comes days after the killing of a British soldier in a machete attack by two converts of immigrant origin. “We were horrified at the death of Drummer Lee Rigby. We’re a peaceful community, but the people who did this just have hatred inside,” Ali told London Evening Standard. Anti-Muslim sentiments have been high in Britain since the killing of the army soldier in Woolwich two weeks ago. Some 212 “anti-Muslim incidents” have been reported after the Woolwich attack last month, according to Tell Mama project, which monitors anti-Muslim attacks in Britain. The mosque attack is seen as the latest episode in anti-Muslim hysteria since the Woolwich attack. “Bearing in mind this is close to Woolwich, bearing in mind that it houses Islamic activities, bearing in mind that they have found alleged EDL graffiti, there's a strong likelihood that this could be an anti-Muslim incident,” said Fiyaz Mughal, of Faith Matters, a group which monitors anti-Muslim hatred. The EDL, which is notorious for anti-Muslim rhetoric, has blamed Muslims and their religion for the army soldier’s attack in Woolwich. The far-right group has staged several protests against Muslims and their mosques in the wake of the attack. "I was shocked to learn of the fire at the Bravanese Community Center in Muswell Hill,”London Mayor Boris Johnson said. "London is a city built on the strength of its communities. Londoners will see this for what it is - cowardly, pathetic and utterly pointless." Tory MP Theresa Villiers, who represents Chipping Barnet, was also shocked by the mosque arson. “I am shocked by this attack in my constituency. This kind of hate crime is absolutely despicable,”Villiers said. Britain's 2.7 million Muslims have taken full brunt of anti-terror laws since the 7/7 attacks.